My very first Jalopnik post, just over a year ago, included a number of illustrations. In those, standing in as a sort of generic everycar, was a funny little dumpy-looking sedan. 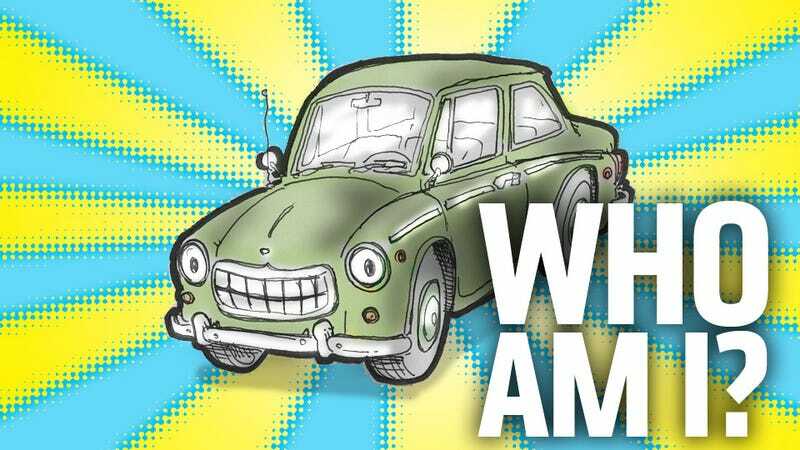 In a number of later posts, I brought that same basic car back, now correctly anthropomorphized, where it has acted as a sort of unofficial Jalopnik mascot — it stands in, humbly, for all the cars we've known and loved or whatever it is a mascot does, exactly. So, with the year closing, I was looking back over things and realizing that, without really intending it, I've grown fond of the humble little car, and thought I may as well make it more "official." But, instead of me just picking a year and make and name, I thought it'd be more fun to open it up to the Greater Distributed Jalopnik Mind. That means you. So, here's everything I know about the car: The original intent was to make a sort of everycar, not one specific type, but something that could just stand in for anything. As it turns out, my idea of "generic car" seems to be stuck somewhere in the mid-to-late '60s, based on the bumpers and overall look. Looking back at the various versions of the car, I alternately see Volvo Amazon, VW Type III, Fiat 1100, shrunken Checker, maybe some Rambler, and a splash of, say early Toyopet. I think we should make up a company, model name, and all that. It's a pretty conventional 2-door (usually) sedan, and from the looks of it I'd guess it's rear-drive. No idea about the engine, but in my head I've always imagined a turbo V3 making about 70something HP. But I'll leave that up to you — feel free to come up with specs for the car as well. And, for the winner, maybe I'll draw you a custom poster of our little motor mascot pal with your winning name and specs or something like that. How's that sound? So, let's say your entries (in the comments, please) need to include: YEAR MAKE MODEL and basic specs of your choice. Have fun!